Shapoorji Pallonji group is ready with one more outstanding residential project to help the home seekers fulfill their dreams. 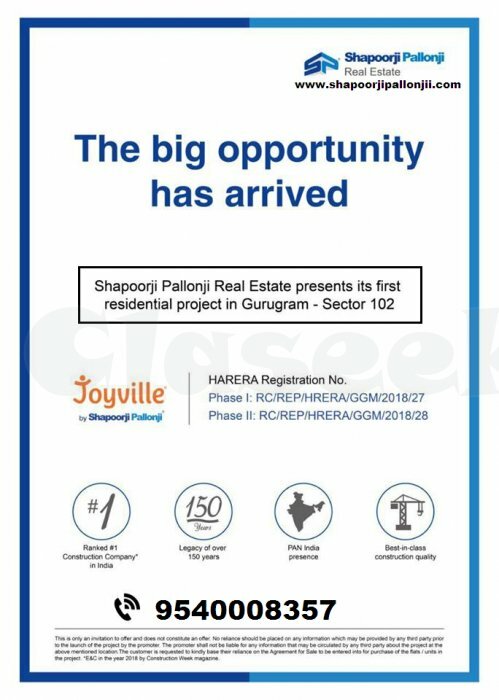 The Project “Shapoorji Pallonji Joyville Sector 102 Gurgaon” is all set to be launched at sector 102 of Gurugram City on Dwarka Expressway. The project will have residential units of different sizes with many specifications & excellent features. 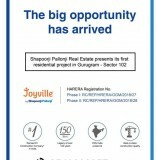 Shapoorji Pallonji Gurugram is offering 2, 2.5 and 3 Bedroom Luxurious Apartments in Joyville Sector 102 Dwarka Expressway. Shapoorji Pallonji is a known name in the Real Estate development and constructional project as there are many Luxurious residential projects on its name which are completed in different cities locations. Now the Joyville Sector 102 of Gurgaon will have this great opportunity of having a perfect township where lots of families can buy their dream homes. Shapoorji Joyville sector 102 offers Luxurious Apartments with open green space area & world class amenities i.e Branded C.P. fittings, Clubhouse, Branded electrical switches, Jogging Track, Wide open balcony, Swimming Pool, Yoga area, Gymnasium, High-Speed Elevators, Back-up Generator for Emergency Power, Each apartment with private courtyard, Open space on the terrace with the relaxation area, Fresh Air & Daylight in every room, sports play area, security system, Landscaped Garden on Podium.